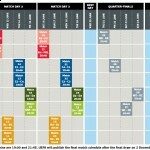 The Uefa Executive Committee has approved the official match schedule for the Euro 2012 finals between June 8 and July 1, 2012 in Poland and Ukraine. In Poland, Wroclaw and Poznan will host three group stage matches, while Gdansk will stage three group stage matches and a quarter-final. Warsaw will host three group stage fixtures, including the opening Group A game, as well as a quarter-final and a semi-final. Poland will play their first two games in Warsaw, and their third in Wroclaw. In Ukraine, Kharkiv and Lviv will stage three group stage matches, Donetsk will host three group stage games, a quarter-final and a semi-final, and Kiev will be the venue for three group stage matches, a quarter-final and the final. 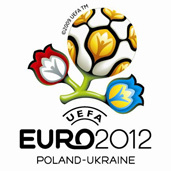 Ukraine will play their opening Group D fixture in Kiev, and their other two group games in Donetsk. I can’t say I find any fault with these decisions. Should be a great tournament.